Fresh ripe blackberries pair beautifully with the toasted hazelnuts in this delicious Blackberry Hazelnut Flaugnarde. It’s the perfect addition to brunch! I know what you are thinking what the heck is a Blackberry Hazelnut Flaugnarde? Well let’s have a little history lesson! The clafoutis comes from the Limousin region of France, and while black cherries are traditional, there are numerous variations using other fruits, including red Cherries, Plums, Prunes, Apples, Pears, Cranberries or Blackberries. When other kinds of fruit are used instead of cherries, the dish is properly called a Flaugnarde. The dish’s name derives from Occitan, clafotís, from the verb clafir, meaning “to fill” (implied: “the batter with cherries”). Clafoutis apparently spread throughout France during the 19th century and I’m so happy it did! I made this a few weeks ago and now that I’m doing round 2 of Whole 30 I’ve been counting down the days until I can have this for brunch! I’ve fallen in love with the blackberry hazelnut combination! Once the oven is heated up add the hazelnuts to a cast iron skillet or pie pan and bake in the oven for about 10 mins until the hazelnuts are lightly toasted. In the blender combine the vanilla, cinnamon, eggs, GF flour, sugar and milk; blend on high until smooth. Once you remove the hazelnuts from the oven add the coconut oil to the pan with the nuts. 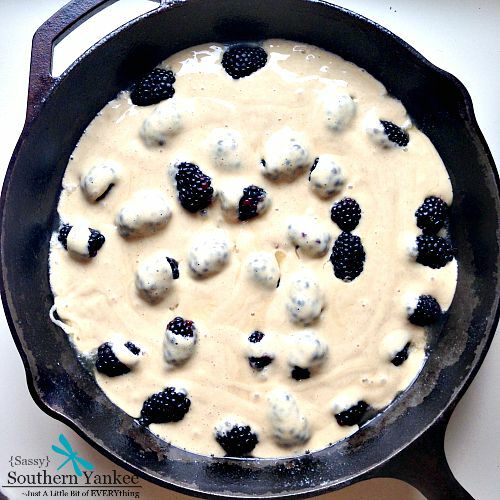 Swirl it around so the pan is evenly coated; then add the blackberries evenly to the pan. Next pour the batter mixture into the pan over the berries and hazelnuts. Bake for 10 mins at 375*; then decrease the heat to 350* and bake and attritional 25-30 min. The Blackberry Hazelnut Flaugnarde should be puffy and golden brown. 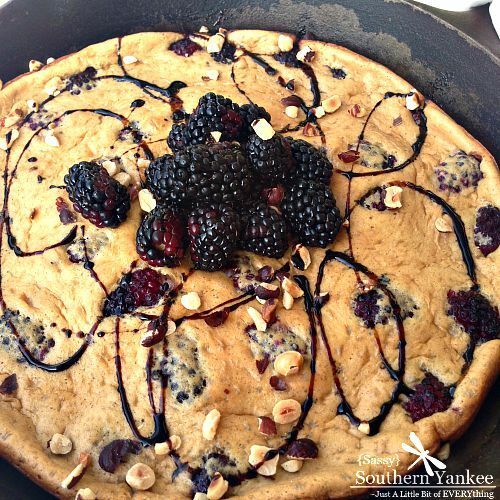 Serve with a bit of powdered sugar and fresh blackberries if desired. Feel free to add whatever fruit you like to make the perfect Flaugnarde! Fresh ripe blackberries pair beautifully with the toasted hazelnuts in this delicious Blackberry Hazelnut Flaugnarde. It's the perfect addition to brunch! Once the oven is heated up add the hazelnuts to a cast iron skillet or pie pan and bake in the oven for about 10 minutes until the hazelnuts are lightly toasted. Next pour the batter mixture into the pan over the berries and hazelnuts. Bake for 10 minuets at 375*; then decrease the heat to 350* and bake and attritional 25-30 minutes. The Blackberry Hazelnut Flaugnarde should be puffy and golden brown. 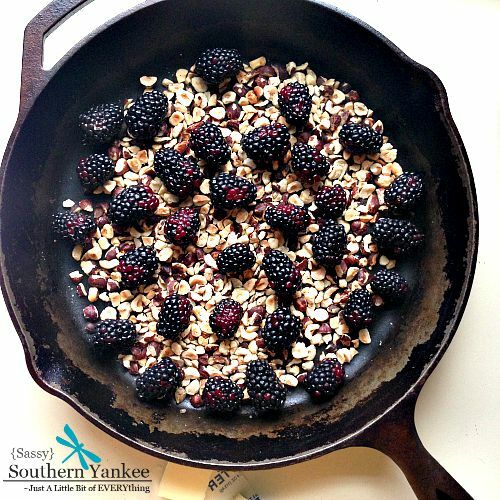 Serve with a bit of powdered sugar and fresh blackberries if desired. 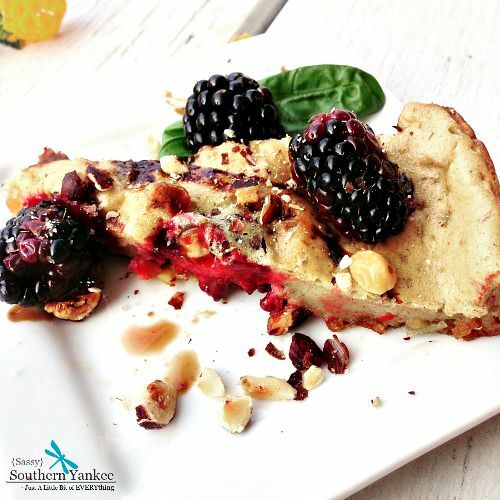 This entry was posted in Breakfast and tagged Blackberry, Brunch, Cast Iron Skillet, Clafoutis, Dairy Free, Easy Breakfast, Flaugnarde, French, Gluten Free, Hazelnut, Pancake, Raspberry.